The February theme for the Food in Jars Mastery Challenge is salt preserving. This is totally new territory for me. So of course I had to try two different recipes. 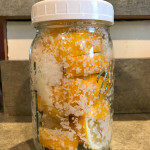 First up: preserved Meyer lemons. I first read about these years and years ago in Deborah Madison’s Vegetarian Cooking for Everyone (my main go-to cookbook). “They’re not hard to make,” she says, and she’s right. But it still took me nearly two decades to get around to it. Meyer lemons are in season right now, so I wanted to make a recipe that highlighted their charms. 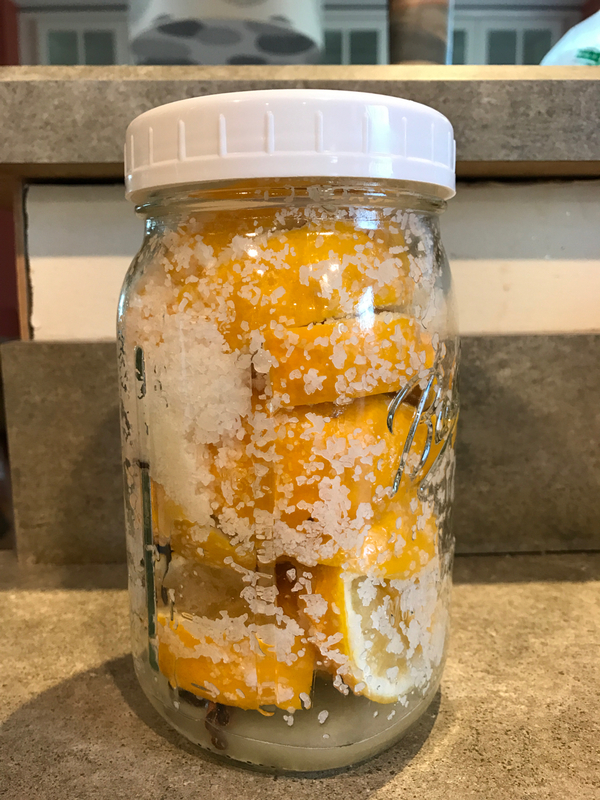 I followed the instructions for “Salt-Preserved Meyer Lemons” in Marisa McClellan’s Preserving by the Pint. The recipe calls for one pound of Meyer lemons, and the prepackaged bag of lemons I found at my local store conveniently equalled that amount. Hooray! This really is an easy recipe to prepare! All you have to do is wash and slice your lemons and stuff them into a quart jar with salt and spices. Easy peasy. I stowed the jar in a cool dark cabinet. and every few days I shake it to move its contents around (after three weeks or so, I’ll move it to the refrigerator for long-term storage). I am looking forward to trying out this stuff, especially after seeing this list of ideas! 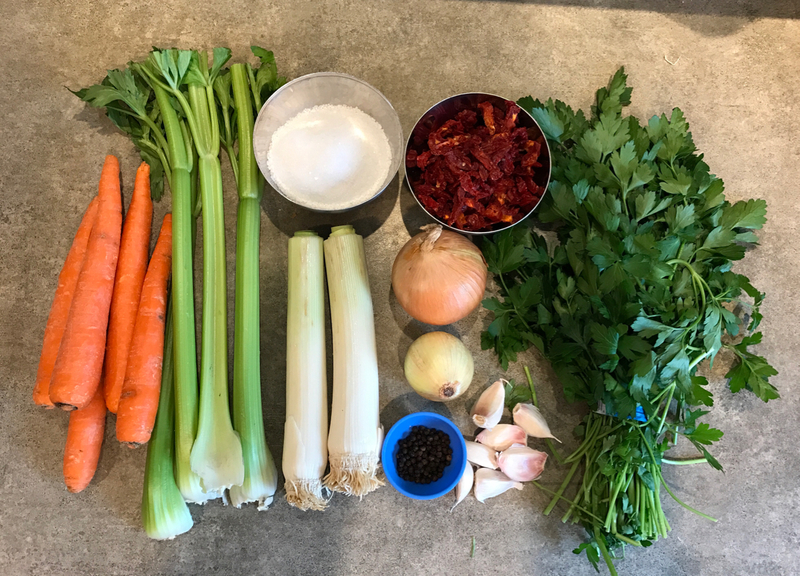 Up next: vegetable stock. 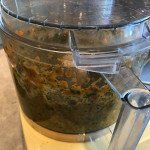 I enjoy making homemade vegetable stock, but all the waiting-to-be-turned-into-stock vegetable trimmings and all the containers of already-made stock really take up a lot of real estate in my freezer. So when I saw that Marisa had a recipe for a vegetable stock concentrate, I decided to give it a try. 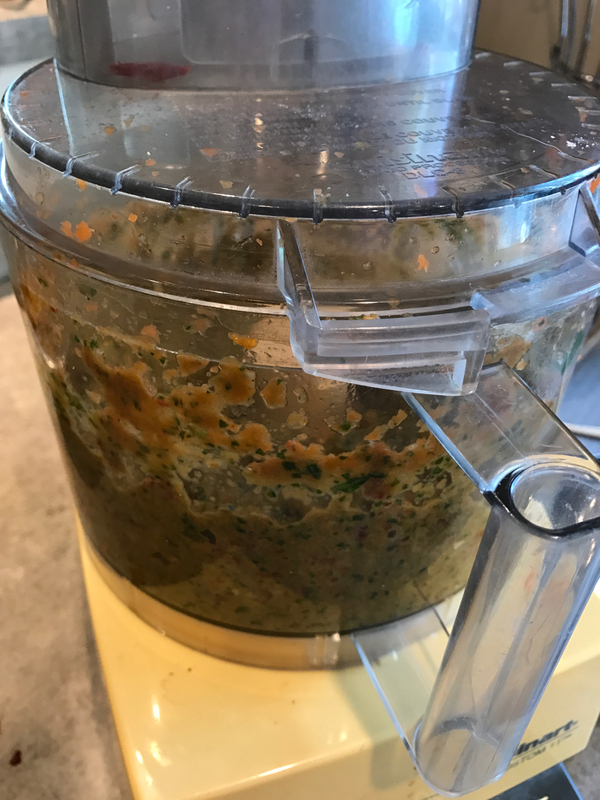 This is another easy recipe: all you have to do is run everything through a food processor until it’s a nicely pureed, gross-looking brown paste, and then store it in the fridge. This really couldn’t be easier. I’ve already used the vegetable stock concentrate once, and with great success. 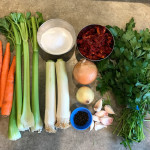 I made the Saffron Cauliflower Soup with Persillade from the cookbook Vedge, which bears the name of the authors’ fabulous restaurant. The concentrate yielded a rich vegetable stock that was a far cry from the anemic stocks that come in aseptic boxes. I’d say it’s right on par with the vegetable stock I usually make—but takes a fraction of the time and effort.